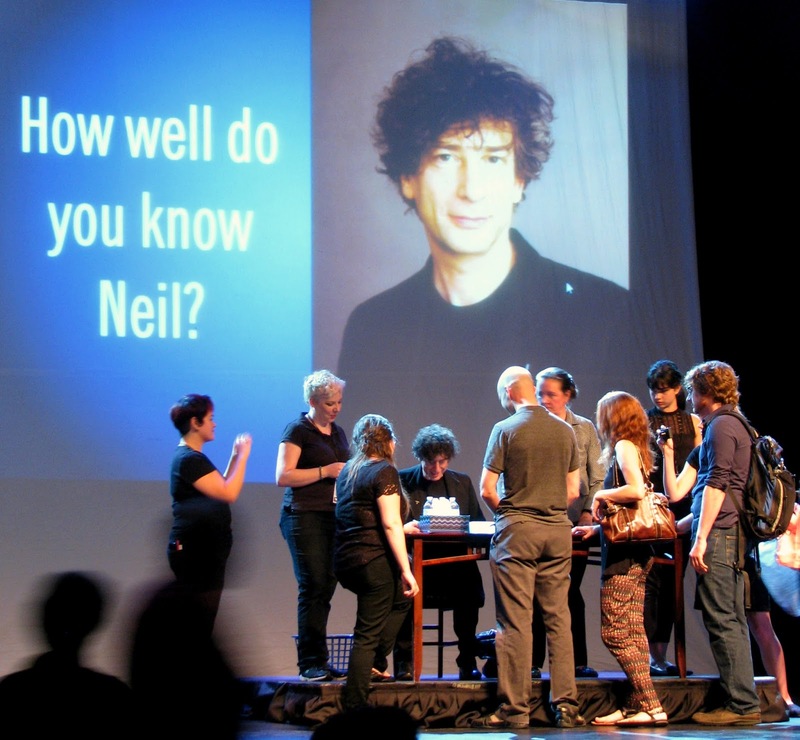 Neil Gaiman has been one of my favourite authors for many years, so I was thrilled back in 2009 to attend "An Evening with Neil Gaiman", a quick-to-sell-out reading and signing event that was part of Toronto's Luminato Festival. I didn't really know what to expect, nor did I bother looking into it - I simply grabbed tickets as soon as I saw Mr. Gaiman post a link on Twitter. It was Neil, he would be doing stuff, and Steve and I would be there to see it. That was all I needed to know. 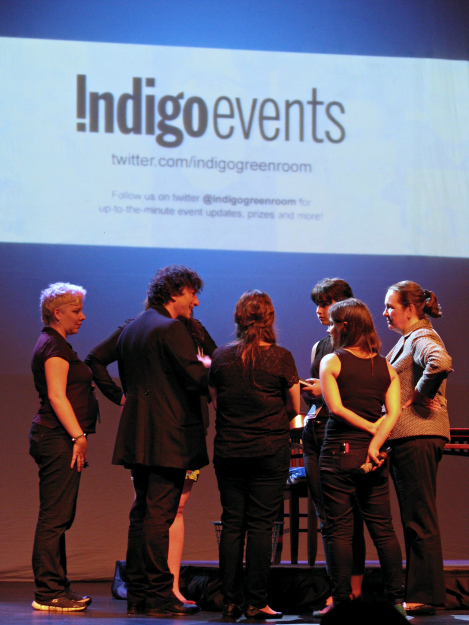 I can't recall now if I had heard much of Gaiman reading from his own work before that event. There are lots of audio recordings and YouTube videos and such out there, and I'm sure I'd enjoyed at least some of them. What I do remember is being absolutely mesmerized by hearing him speak right there, in person. Neil was back in Toronto again this past Tuesday and, listening to him live for the second time, I finally began to understand what was happening. When Neil Gaiman writes, it's as though he's gently pulling back the corner of the world - just enough, mind you - so he can show you the magic underneath without disturbing it. I suspect that his writing is, at its core, an act of love. He understands how wonderful and beautiful and funny and terrifying and utterly astonishing the world can be, and he cares enough about other people to want to share that with them. So sure, his reading voice is lovely and he does great characters and he's witty and he knows all about pacing and so on and so on. But when he's there in front of you reading from his work, or even when he's answering questions on the fly, the most important thing is that you can hear this mix of kindness and joy and awe layered under his excellent storytelling skills. You can hear the love. That sounded ridiculously cheesy, and I don't want to give you the wrong idea. Gaiman is one of my favourite authors, but I'm not an uber-fan - I'll admit I haven't read all his books yet. Back in 2009, we didn't even stay for the signing. That event took place at the St. Lawrence Centre for the Arts, which was where Steve and I both worked at the time. 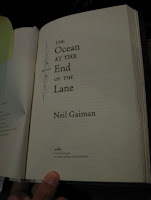 So, rather than lining up for an autograph, I satisfied myself with cutting across an employee-only upper level walkway connecting the spaces so I could get a few candid photos of Mr. Gaiman from the top of the lobby stairs. The pictures weren't even very good, but I was happy just watching him sign for a few minutes before heading home. stairs in June 2009. I served coffee from those urns! This year's event however, was part of what's being billed as "the last signing tour," and it was actually Steve who, as soon as I bought the tickets, insisted that this time we were going to stay (apparently he felt guilty last time, convinced I decided to leave on his account). 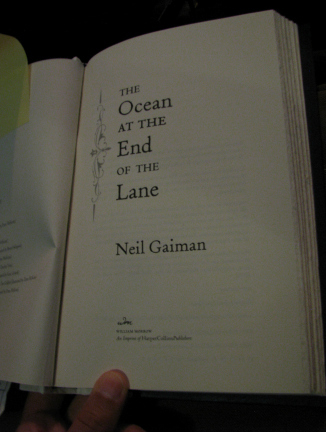 So on Tuesday I packed up my copies of Gaiman's short story collection Fragile Things and his new book The Ocean at the End of the Lane, and went to meet Steve outside the Danforth Music Hall (according to the venue website, there are 1145 seats and yes, it was very sold out). 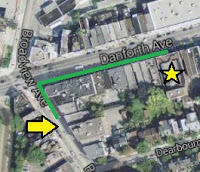 We didn't anticipate the lineup that trailed along the Danforth and wrapped around the corner to head south on Broadview. It was a wonderfully eclectic mix of people standing around, very politely filling up the sidewalk. Someone in front of us had a doll sticking out of her bag, and Steve was pleased to see someone with a tattoo written in Elvish runes. The best part however was when random people going by would ask someone in the line what musician was playing that night, and would be enthusiastically told by several people that we were there for an author. Neil Gaiman! Have you heard of him? You should read his new book! for the night before the signings begin. There is still a line. I can't start until you are all sitting down. Alas RT @GhostLatitudess: @neilhimself You're late. It was a very silly thing for me to say in the first place. Maybe if we'd stayed for the signing in 2009, I would have known better. 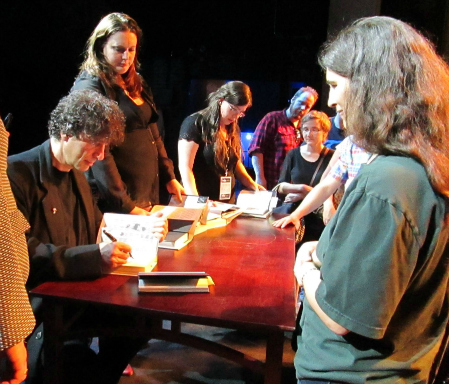 See, part of the reason that this is "the last signing tour" is because Neil Gaiman signs for everyone, no matter how long it takes, and it's getting to be too much. So he's doing one last, massive round, then he's hanging up his autographing pens (and he does need several). But I discovered on Tuesday that he does far more than put his name on things. He is very, very good at making everyone feel special. Sure, you don't get long with him, but for that one moment, he is all about the person in front of him. 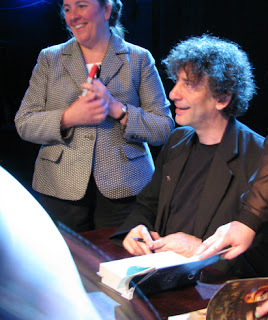 Neil Gaiman, smiling at a fan. As we approached, I watched him take gifts, shake hands, and mostly, pay absolute attention. For many people, meeting him was clearly a huge moment in their lives. People walked away from the table giggling, squealing, beaming, and yelling things like "That was incredible!" When it was finally my turn, he signed my book carefully, then looked up and into my eyes with a very deliberate focus. It was my chance to say what I wanted to say, and he would listen. I think a lot of people had practiced speeches and such - I just said thank you, and he said it back, and then he held out my books. And, as a final act of absolute commitment to giving each fan their moment, he waited for me to be the one to look away. Neil signs, I stare, Steve photographs. It was the same as his writing and his reading.Obviously, Neil Gaiman can't care about each fan as an individual the way they care about him. But he can care about people, and you certainly get the feeling that he does. Long story short, Neil Gaiman seems like an excellent human being. Great article! I was there and brought my daughter (who has only read Coraline) and we both enjoyed it so much. I love book signings because it's so much fun to be in a room (or line) with not only fans but book lovers. Have you listened to Neil read The Graveyard Book on http://www.mousecircus.com/videotour.aspx. I listened to this, a chapter a night, and was enthralled by the story and Neil's wonderful reading. It IS a lot of fun to be in a room of book lovers, isn't it? 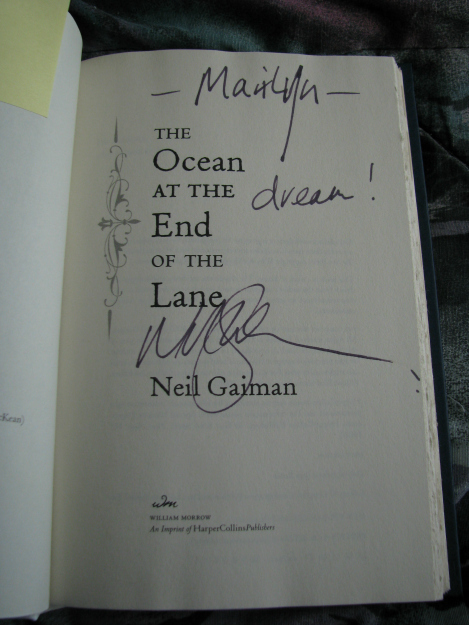 And that's fantastic that you took your daughter to see Neil Gaiman! How old is she? I love your article! I wasn't at this particular event, but I did go to his Dallas signing in June. It was so fun! My friend Rachael and I listened to his "Fragile Things" audiobook on our drive down from Oklahoma City to get psyched up. We even had a great time waiting in line, comparing our Doctor Who shirts to those of the fellow nerds around us. Inside the theater, we sat next to and chatted with Marc, who drove in by himself from Austin. He and I are now Twitter buddies. It's always a great experience to connect with other people over a shared love of someone's work. 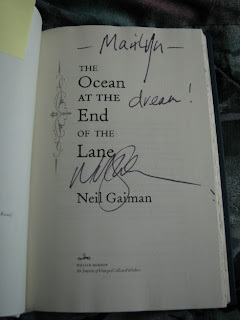 At the signing table, I had planned to tell Neil more than just "Hi!" and "Thank you," but I got a bit tongue-tied when he commented on my t-shirt. Rachael just couldn't stop saying, "Thank you so much! Thank you so much!" Neil's work means so much to so many different people, and I totally agree that he seems like an excellent human being. He is outrageously kind to his diverse fans, all shapes and sizes. I'm glad you liked the post. It sounds like the Dallas event was great fun. And I admire all the people I'm hearing about who traveled to see him! I love Fragile Things. I don't own many short story collections, but there are so many wonderful things in that book. I should really listen to the audio version as well. Did you have a favourite?